The location was excellent and the hosts were very gracious. The rooms and the facilities were just what we needed after 4 days in Athens. Thank you. 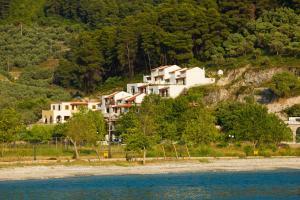 This hotel is very close to the most beautiful beaches on Skopelos island. We had a large room with a great balcony! Beautiful sunset! The service and the staff was excellent. Very friendly and flexible! Thank you very much for the wonderful time! 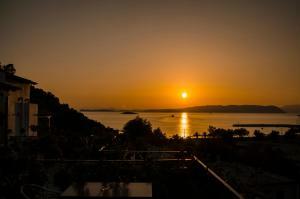 Loved the location, the view, the terrace of our room, the staff is always so helpful and nice. The beach there is probably the most beautiful and calm. Little village of Neo Klima is pleasant and fun, and not touristy at all. Great location, excellent room with view, quiet air conditioner. Staff very helpful - Konstantinia helped get us trips very efficiently, including a replacement cab where a trip was not running. Efficient transfer arrangements from the ferry - Mr Nikos was up very early to run us to the return. Excellent taverna attached. The room was spacious and comfortable and cleaned daily. Linen and towels replaced every 2 days. This place is absolutely fabulous: beautiful view from the balcony, large and clean rooms, good breakfast and very, very nice people! The location offers a lot of possibilities: nice beach very close to the hotel, very good places to eat and a beach bar for the night. ..and they have the best WiFi! :) Thank you! Lock in a great price for Hovolo Hotel Apartments – rated 8.5 by recent guests! Hovolo Hotel Apartments This rating is a reflection of how the property compares to the industry standard when it comes to price, facilities and services available. It's based on a self-evaluation by the property. Use this rating to help choose your stay! 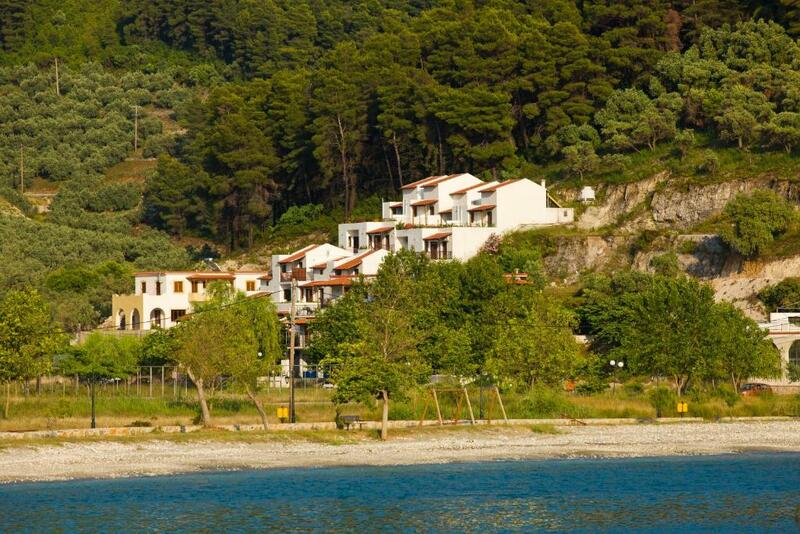 Hovolo Apartments is located on Neo Klima’s coastal road, 350 feet from the beach. Amphitheatrically built at Hovolo Hill, the apartments are spread on 5 floors and feature a balcony or patio with sea views. The on-site restaurant serves fresh fish, seafood and other homemade dishes. 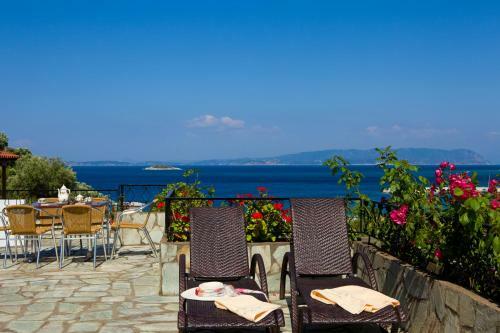 Enjoying panoramic views of the sea, every unit at Hovolo is fully furnished in the local traditional style and includes a living room, a fully equipped kitchen and a veranda. Air conditioning and TV are included. Free WiFi is available. Greek buffet breakfast with homemade dishes and sweets is served at the apartments’ lovely courtyard. 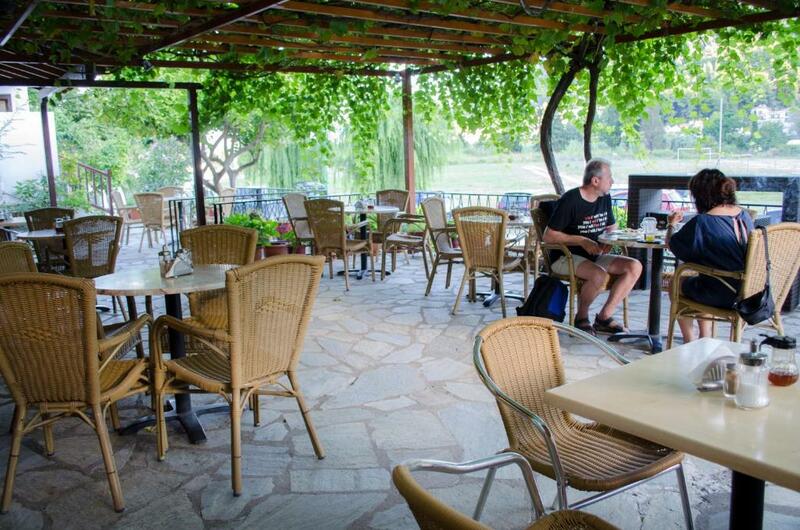 Other hotel facilities include a bar and a lounge area with TV and free WiFi. Basket, football and beach soccer are available at nearby public area. The reception can arrange for car/motorbike hire, while there is a spacious parking area available free of charge. Free shuttle services from/to the port are provided. The beaches of Hovolo and Kastania are accessible within a short drive. The scenic village of Neo Klima has a marina for sailing boats, traditional taverns and super markets. When would you like to stay at Hovolo Hotel Apartments? This open-plan apartment comes with a bedroom, a kitchen and a living room. It is located on the ground floor or 2nd floor and it has either a veranda or private balcony with views over the surroundings. This apartment can accommodate up to 3 people. Open-plan apartment with bedroom, kitchen and living room. Has either a small veranda with sea view. Furniture & rooms design are refreshed for 2011 with a modern touch without losing the traditional character. The room rate is based on 2 guests. Maximum occupancy is 3 guests. Please check hotel policies. Guests of the honeymoon suite receive a fruit basket, a bottle of wine and complimentary flowers upon arrival. 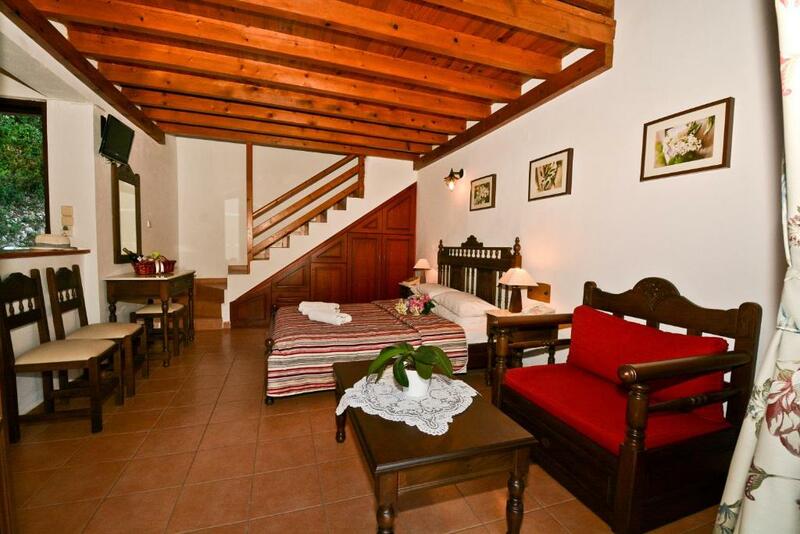 Beautifully decorated, romantic room with modern style and private balcony. Open-plan apartment with bedroom, kitchen and living room. Located either at the first or the third floor, it opens out to a spacious, private balcony. Special offer includes either hiking tour or boat trip. Featuring contemporary decoration, this unit offers bedroom, kitchen and living room. It has sea view. House Rules Hovolo Hotel Apartments takes special requests – add in the next step! Hovolo Hotel Apartments accepts these cards and reserves the right to temporarily hold an amount prior to arrival. 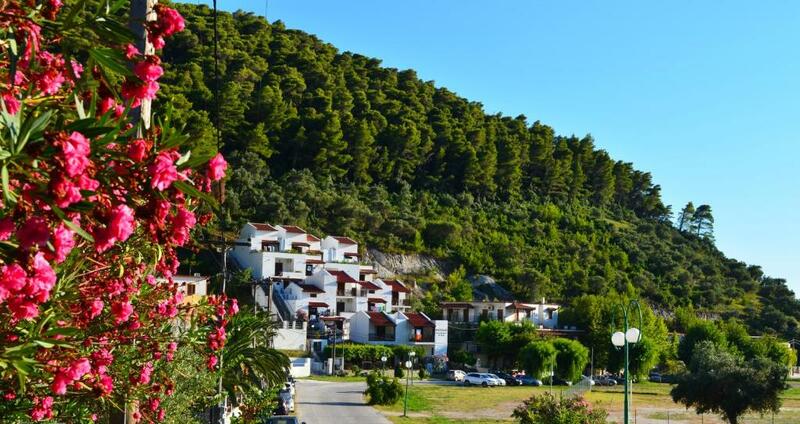 Hovolo Hotel Apartments arranges free transportation upon request, from both ports of Skopelos on the dates of arrival and departure. Guests are kindly requested to contact the hotel reception with their exact time schedule. Kindly note that there is no elevator and access to the apartments is provided via stairs. Please inform Hovolo Hotel Apartments of your expected arrival time in advance. You can use the Special Requests box when booking, or contact the property directly using the contact details in your confirmation. Very uncomfortable bed, stayed awake all night as the springs were pushing against my body. Rest of the room was very dated. Only thing that could be little better is the bathroom. Sometimes beans become annoying esp during the morning and noon hours but everyone I saw learned to deal with. There is a NON PRIVATE terrace where everybody passes throw, so we have not a (panoramic/superior) sea view from the room. "Sulerior" is only the 4 floor without a lift you have to hike. It's not a good deal, quality/price. The location is very good and the place very quite. The staff is very kind and gentle.